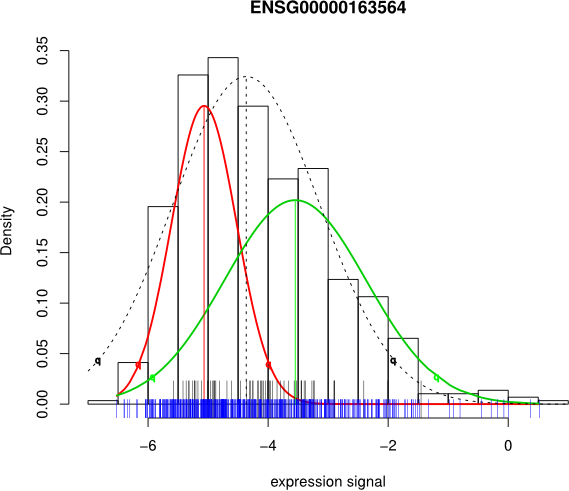 Provides a mixture model fit of two normal distributions for the given genes. Each gene is processed individually. samplesets Matrix Samples associated with the model components. Provides the posterior probabilities for each sample to belong to the first components. minDifference float 2.0 The difference of the distribution component means is at least this many times the standard deviation of the less variatiating distribution. minInfo float 0.0 Minimum for the normalized mutual information score when groups 1 and 2 are defined. minProportion float 0.2 The smaller distribution component should cover at least this proportion of the samples. sdPoint float 2.0 Cut-off points are visualized at (+,-)sdPoint*mean. sectionTitle string "Gene expression mixture model" If non-empty, a declaration of a new section with the given name is inserted to the beginning of the combined document.